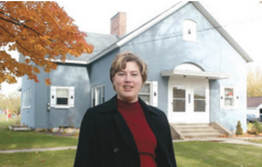 Zeeland Historical Society President Amy Langeland stands inside the former New Groningen schoolhouse on Paw Paw Drive, which the society is renovating back into a two-room school. The Zeeland Historical Society president recently requested more funding from the city so the society can continue to archive Zeeland's history. In a letter to City Council members, President Amy Langeland requested an increase to the society's annual stipend from $1,000 to $2,500. While the society is grateful for the amount it receives, she said, it has been the same amount for 30 years. Langeland said the additional funding is needed to help the society continue to serve the city. "The Zeeland Historical Society and the Dekker Huis Museum is one of the only cultural destinations in the city," she said in the letter. "We act as a city archivist of historical photos both of homes and businesses as well as important artifacts from this area. We provide free or low-cost access to most programs, and museum admission is free of charge." The society operates the museum at 37 E. Main Ave. The museum offers exhibits such as a Pioneer Room, replicas of the city's first bank and grocery market, a Victorian parlor, 1920s kitchen, doctor's office, and church room along with police, fire, and military displays. The society also is working to renovate the former New Groningen schoolhouse on Paw Paw Drive. With fundraising, the society was able to purchase the former schoolhouse, which was in use from 1881 to 1951 and had been turned into a duplex, for $154,900. Society members expect the renovations to cost about $100,000. The city contributed $10,000 to the effort and Holland Township contributed $50,000. The society plans to move the museum's schoolhouse exhibit to the former school once its completed. Langeland also highlighted the society's participation in community events, such as visits by dignitaries, the Show and Shine car show, Pumpkinfest, and the Zeeland Magical Christmas Parade. The society was formed in 1974 by about 25 residents interested in preserving the area's history. It now has more than 300 members from throughout the United States. City Manager Tim Klunder said the society's request will be reviewed by the City Council during its budget process in March and April.